Kahurangi National Park in the northwest of the South Island of New Zealand is the second largest of the thirteen national parks of New Zealand. It was gazetted in 1996 and covers 4,529 square kilometres (1,749 sq mi), ranging to near Golden Bay in the north. Much of what was the North-west Nelson Forest Park formed the basis of the new park. Kahurangi Point, regarded as the boundary between the West Coast and Tasman Regions, is located in the park, as are the Heaphy Track and Mount Owen. The park is administered by the Department of Conservation. Tramping, rafting and caving are popular activities in the park. After being prohibited for several years, mountainbiking was allowed on the Heaphy Track on a trial basis for the winters of 2011, 2012 and 2013. The effect of the cyclists on trampers and the wildlife will determine whether the trial continues or not. The park hosts a large variety of animals and plants unique to this geographical location, including the Grass Tablelands seen here. It is one of the two places in the world where takahēs are found in wild, the other being the- Murchison Mountain in Fiordland. In 2018, eighteen takahē were reintroduced for the first time in the park, 100 years after they become extinct from here. In 2019, it was announced that large parts of the Mokihinui River catchment, including 15km of river bed, would be added to Kahurangi National Park. In addition to ongoing conservation work by the Department of Conservation, there is a community initiative that aims "to implement, in partnership with the Department of Conservation, a conservation strategy to bring about the protection and/or return of endangered and threatened flora and fauna to the Flora Stream catchment area in Kahurangi National Park. This will enhance the experience for all visitors to this popular area, resulting in wider community appreciation and use of the Park." The society now has approximately 30 kilometres of trap lines, with all traps at 100 metre spacing. A wasp eradication programme is in place, and bird monitoring is also part of the society's programme. ^ Heaphy Track mountain bike trial Department of Conservation. Retrieved 18 December 2012. ^ "Our Mission". Motueka, New Zealand: Friends of Flora Inc.
^ "Tourism working with conservation". Motueka, New Zealand: Bush & Beyond. Archived from the original on 2012-07-21. 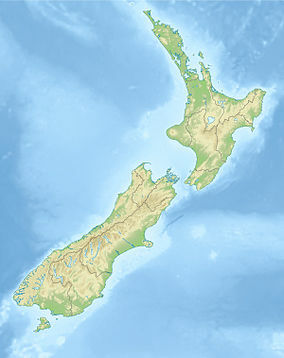 Wikimedia Commons has media related to Kahurangi National Park.